Artisan is the result of over two years hard work and is more than just a refined update of it's predecessor Subdivide and Smooth(SDS). It is a complete re-work with a glut of new features added to turn SketchUp into a true organic modeling application. The first thing you'll notice is the toolbar. 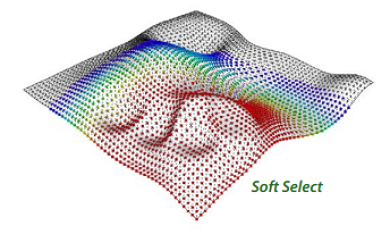 It's BIG and packed with exciting tools, in essence, four tools - SDS, Sculpting, Vertex Editing and Polyreducing. For those already familiar with SDS you'll feel immediately at home with the same options as before but given some behind the scenes improvements to make it quick..... blisteringly quick! Dale has taken all the feedback from SDS and implemented these to improve the workflow. 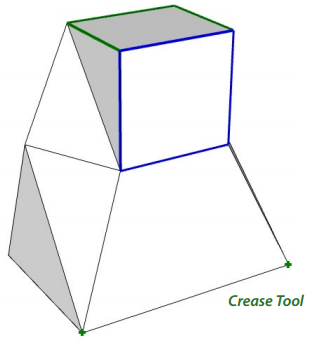 The 'Crease' tool for instance now leaves coloured indicators where you've applied to edges or endpoints. It can also crease 'all' edges by clicking on a face. Also 'Subdivide' has got an overhaul and it is more responsive and, when used via Proxy, you can quickly change the subdivision iteration through an onscreen dialog box. The Sculpting tools are a lot more than the three icons you see. First off is the 'Sculpt Brush'. This has five modes - Sculpt, Inflate, Flatten, Pinch and Smooth. You can quickly swap between modes using either the TAB key or right clicking. It's this behaviour that makes transforming meshes effortless. That, along with a very intuitive cursor that can control both size and strength of the transformation via arrow keys. The cursor itself adapts to the underlying geometry as you pass over faces and vertice, with the RED strength indicator displaying where the direction of the transformation will occur. It's a simple solution for a very powerful toolset and quite quickly you'll find yourself swapping between modes and sculpting with ease. 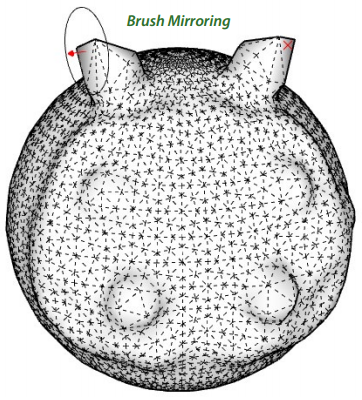 A fantastic addition is the Brush Mirror Plane. 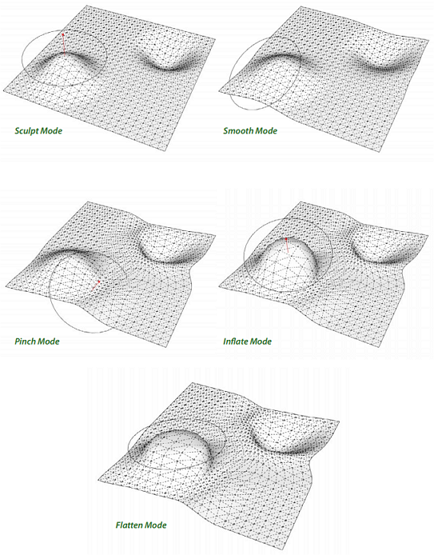 This allows you to mirror everything you transform making symmetrical modeling a cinch. If you're familiar with Sculptris, 3D Coat or ZBrush you'll love this! Next is the 'Select Brush'. Think of it as literally painting a selection faces and controlling that selection by the size of the cursor and modifier keys. What may seem understated at first soon becomes very apparent when used in conjunction with other tools. 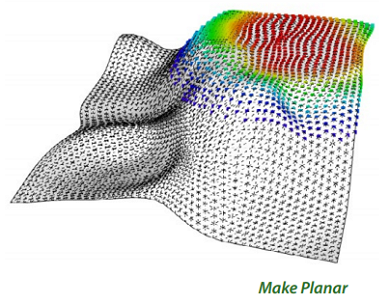 By painting a selection and by either subdividing or smoothing you have a lot more control over your mesh. This allows you to add finer adjustments in certain areas quickly. Lastly, for the Sculpting toolset we have the 'Paint Brush'. Just pick a material for the material browser and spray it on. 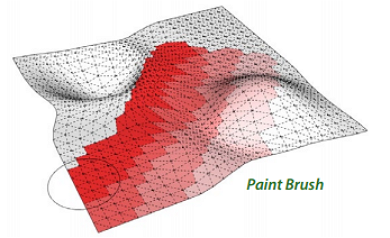 You can also paint projected textures by sampling allowing for some interesting results. Not quite UV Mapping but with some careful planning you can get pretty darn close. Artisan's next toolset is Vertex Editing. 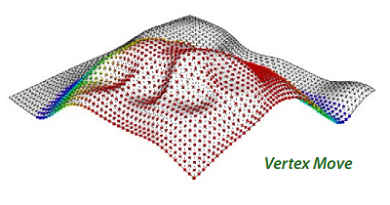 You've four primary tools at your disposal - Vertex Select, Vertex Move, Vertex Rotate and Make Planar. where as the hard selection has no fall-off; so any transformations can be extremely harsh. 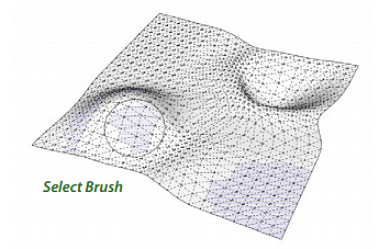 There is one great feature where you are able to use the 'Select Brush' to choose the area, then switch into Vertex Editing with that same selection. Once you have the vertices you need selected, it's time to play! 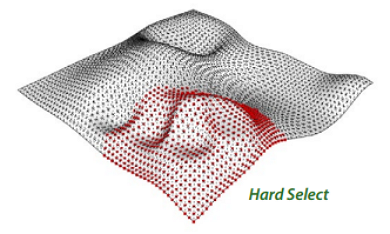 With the Vertex Move tool you can also TAB between hard and soft selection mode. And, using the arrow keys to constrain movement along an axis or SHIFT to move along a normal. 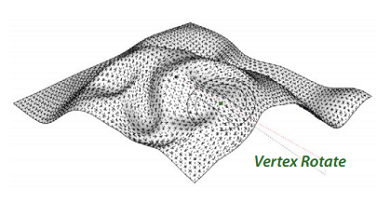 The Vertex Rotate is similar to Sketchup's native, but it leverage's Artisan's vertex selection feature to allow for some really clever manipulations. Finally there's Make Planar. It's like taking an iron to your mesh. All the vertices in your selection are simply flattened. Last but far from least is PolyReducer. This has actually been around for awhile and it worked(sort of! ), but the version bundled in Artisan is a lot faster, very stable and works 100% of the time. The previous version had a few gremlins that caused BugSplats and took forever to calculate, whereas this version is very robust. Regardless of what I threw at it, I reliable spat back out the desired result. It really compliments the Artisan toolset as you'll find yourself creating very detailed meshes quite quickly. Having the ability to reduce those is a welcome addition. We all know SketchUp struggles with intensive polygon counts, so this is a great weapon in your back pocket. Overall, my impressions of Artisan left me stunned. The possibilities it has opened up are endless and it's incredibly intuitive to use. This is ESSENTIAL! SketchUcation Premium Members get $10 off Artisan when you purchase through your account here!